When Mike and Mary Jane Foster Opened the first Hometown Pizza 30 years ago, their vision for fresh, quality pizza became a reality. Since 1982, Hometown Pizza has delivered that vision, serving delicious pizza made with premium ingredients to their hometowns. Each of the 15 restaurant locations is staffed with employees from the area's high schools and neighborhoods.Some of these 400 total employees chose to carve out a career with the company. Donna Sabo, a general manager at the first store in LaGrange, has been with Hometown for nearly a quarter of a century. Tina Dermon is approaching her 23rd anniversary as a Hometown Pizza server in Carrollton. Overall, there are 18 employees with more than a decade of experience, and 35 with more than 5 years experience. Since the beginning Mike and Mary Jane Foster have made a commitment to partnering with local small business to aid in the growth of both businesses. Most produce ingredients come courtesy of distributor Danny Griffin, an old friend from Foster's hometown of Mount Washington, Ky. "I feel very, very lucky to work with Mike Foster and Hometown Pizza," Griffin said. 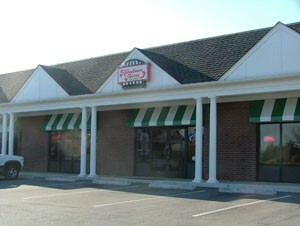 "I've supplied produce to Hometown Pizza since 1989. I started with him in Shelbyville. From that point, wherever Mike went, I went." Foster and Griffin's camaraderie is so strong that Griffin fills out his own order for produce for each of the stores. 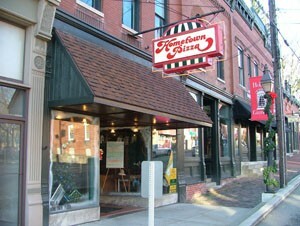 Uniforms for Hometown Pizza employees come from a local shop in Bardstown. Most print work, from menus to signage, comes from a company in Buckner and another shop on Baxter Ave. in downtown Louisville. "We consider each restaurant to be a true investment in the town and community in which it is located. We want to become a landmark in each town and blend into the community's culture," said Tom Brown, Director of Operations for Hometown Pizza. "We consider our investment in these communities as 'Putting our money where our mouth is,'" Brown said. Knowing the people they work with is essential to their business philosophy. Brown likes to "connect the dots" when it comes to getting creative and thinking of new ideas; "Figure out what people can do for you, then apply it to create better business for the company, employees and guests," Brown said. A good example of that is the way Hometown shreds their cheese in house. The practice started out as a way to fight the volatile cost of cheese. Prices are more stable when you buy cheese by the block, and the product tastes better and does not need the addition of any anti-caking agents. 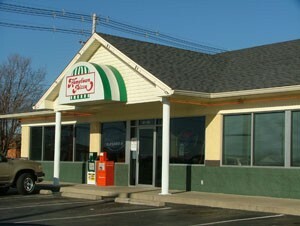 The only thing Hometown Pizza needed was a great cheese shredder. They found a cheese-shredding machine developed by Pete Palazzolo, a "backyard engineer." End result? An improved product, better pricing, and a brand new local connection. Staying local keeps Hometown in business. 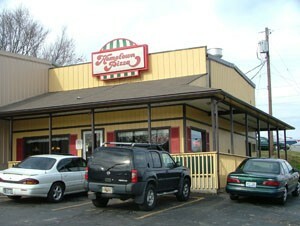 "We want our guests to be able to stay close to home and receive not only quality food, but outstanding service as well," said Katie Martin, Director of Marketing and IT for Hometown Pizza. Hometown's dedication to superior service also means listening to their guests' ideas. Certain menu items have been directly influenced by guest suggestions. 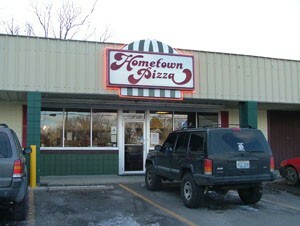 For example, Hometown now offers a gluten-free pizza at the request of their guests. Employees are encouraged to get creative and test new topping combinations. Many do just that during their lunch breaks, and that has resulted in menu items like Bacon Cheese Fries, Buffalo Chicken Pizza and Chef Salad. Before any new creation makes it to the menu, it must pass the ultimate test. That comes from founder Mike Foster, who has impeccable taste. "He can taste things you'll never pick up in your lifetime," Martin said. 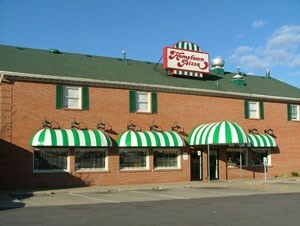 It is Foster who maintains "the gold standard" when it comes to the Hometown menu. 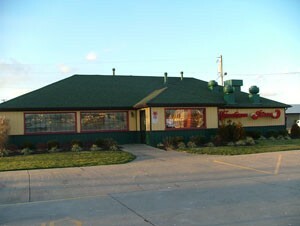 Maintaining high standards while having the freedom to get creative is what makes Hometown Pizza so successful. This freedom translates to happy, loyal employees and guests who always come back for more. This has allowed the company to grow at a comfortable but steady pace, and their plans for the future include sticking to that system. 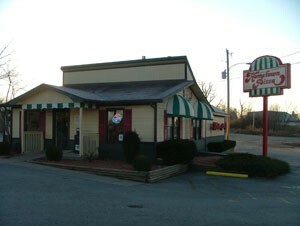 Currently, there are restaurants throughout Central Kentucky, including; Bardstown, LaGrange, Bedford, Middletown, Bloomfield, Mt. Washington, Carrollton, Owenton, Crestwood, Preston Highway in Louisville, Eminence, Shelbyville, Hodgenville, Taylorsville and Warsaw. The Foster's idea thirty years ago still rings true: maintain the hometown, family feel. 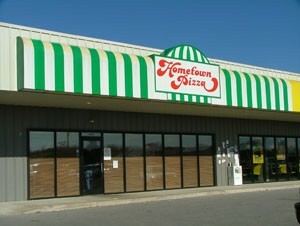 With Hometown Pizza, the name says it all.